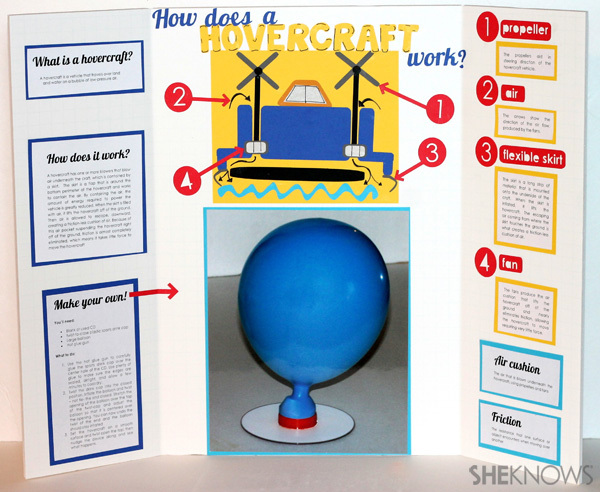 Talking about the concepts of airflow and friction might bore your kids to tears, so why not bring fun into the science classroom with this build-it-yourself hovercraft project? Your kids will have so much fun that they will hardly realize they are learning along the way. This would also make a great science fair project! 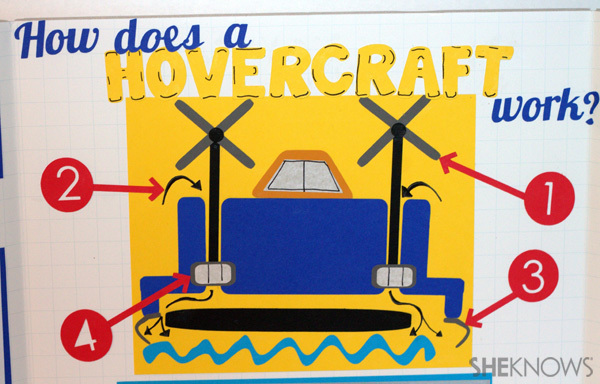 This hovercraft project is fun and very hands-on. It demonstrates the concepts of airflow and friction in ways that you can actually see and feel, rather than just reading about them in a book. The model is so simple to build that even the youngest scientist can assemble it with very little assistance. Plug in the glue gun and allow ample time for it to heat up. 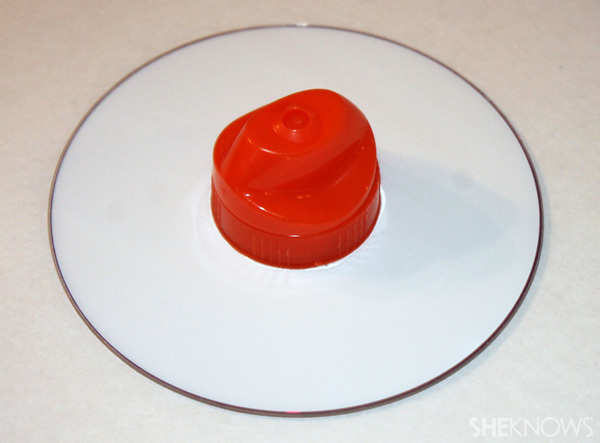 Use it to carefully glue the sports-drink cap to the top of the CD, over the center hole. Use plenty of glue to make sure the outer edge of the cap is sealed, airtight, to the top of the CD. It may be necessary to apply multiple layers of glue, both in between the cap and the CD as well as around the perimeter of the cap. Allow a few minutes after gluing to make sure the glue is completely cooled and dry. Twist the drink cap into a closed position. Inflate the balloon to about 75 percent of capacity and temporarily twist the end closed (don’t knot it closed), leaving as large a tail as possible toward the open end of the balloon. Now, stretch the opening of the balloon over the top of the twist cap and adjust the balloon so that its opening is centered over the center of the cap. 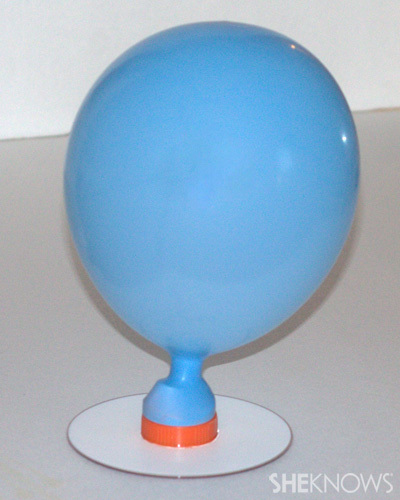 You can now undo the twist at the end of the balloon, and the balloon should stay inflated. If any air leaks out when the cap is twisted closed, inspect where the air is escaping from, remove the balloon and repeat Step 1 to seal the leaks. 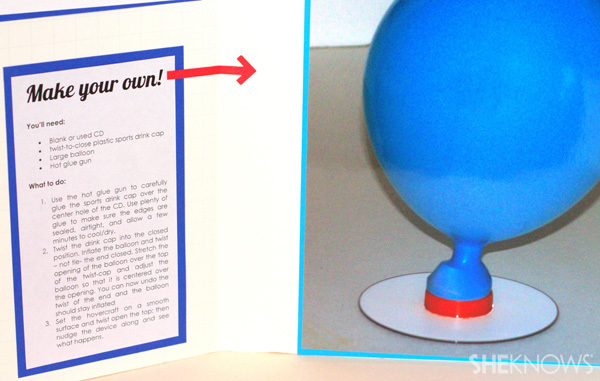 Set the hovercraft on a smooth surface and twist open the top. Then, gently nudge the balloon along the surface, noting the almost complete lack of friction. The hovercraft you just made should glide like it’s floating on air. 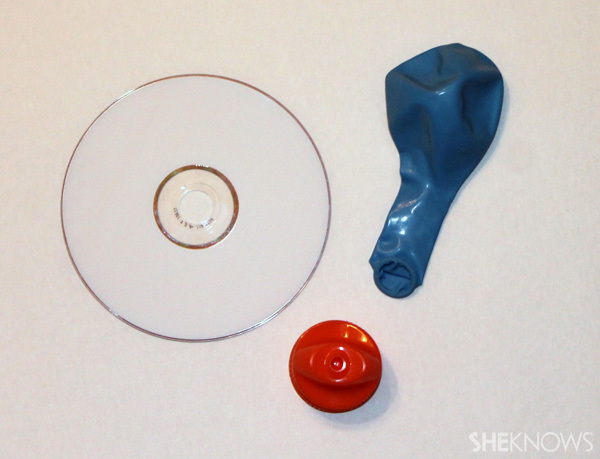 The balloon can be reinflated by blowing through the center of the CD with the cap twisted open and then pinching the balloon and twisting the cap closed. Use a ruler and a piece of scrap paper and make a rough sketch of what you’d like the finished poster to look like. Keep in mind how big you’d like your title to be, how much room you have for your project explanation and where the pictures are going to go. Several options exist for creating the letters for the poster. The easiest method is to purchase letter stickers in various colors, shapes and sizes. To make your own custom lettering, create your words in a word-processor program and print the words out directly onto the card stock. Make sure to edit your font to create just the outline of the letters with a transparent fill. In Microsoft Word, this is easily done using Text Effects and choosing the transparent letter with a shadow. Once your letters are printed, carefully cut them out using a craft knife or scissors. When cutting out a cursive font, take care to ensure that each word stays joined. That will make your assembly much easier. Type and print out the text for your poster on card stock, trim away excess paper and back it with another sheet of card stock that is of a coordinating color and is an inch wider and taller. You can then add text and graphics such as terms with definitions, a labeled diagram or information about how a hovercraft works. Use the Elmer’s Extra-Strength Glue Stick to secure all of the elements to the board, taking care to glue down all corners to prevent them from curling up. This post was sponsored by Elmer’s.